It is most popular in the countries, Malaysia, Australia, Greece, Thailand, United States & Taiwan. 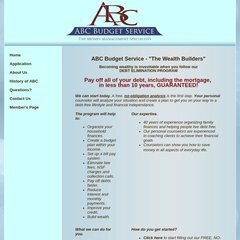 abcbudget.com Budget Counseling, Bill Paying, Debt Elimination and Wealth .. The estimated 9,641 daily visitors, each view 2.85 pages on average. Packetexchange Inc California is the location of the Microsoft-IIS/5 server. It has 1 DNS records, members1.infozion.com. The site is programmed for ASP.NET. PING www. (72.37.137.27) 56(84) bytes of data. Website load time is 3077 milliseconds, less than 87% of other measured websites. As well, a ping to the server is timed at 66.2 ms.